The portrait of King George II is after a painting by Thomas Worlidge, engraved by Richard Houston. Here are the prints of a naval scene and of Liberty. This pear shaped Worcester jug is transfer printed in black with a portrait bust of George II. 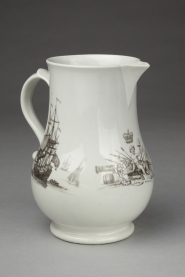 The other side of the jug bears a print of a sailing ship and below the spout is a print entitled "Liberty" on a scroll. This shows a boy holding a cap of liberty, seated amongst military trophies and below a royal crown. This print is signed "RH Worcester" with an anchor, for Robert Hancock as engraver and Richard Holdship as printer.